Sauteed Chickpea Salad with Roasted Red Peppers, Mint, and Sumac is so delicious; if you haven’t tried Sumac, get some soon and then make this salad! And the salad is vegan, gluten-free, dairy-free, low-glycemic, and delicious! Use the Diet-Type Index to find more recipes like this one. 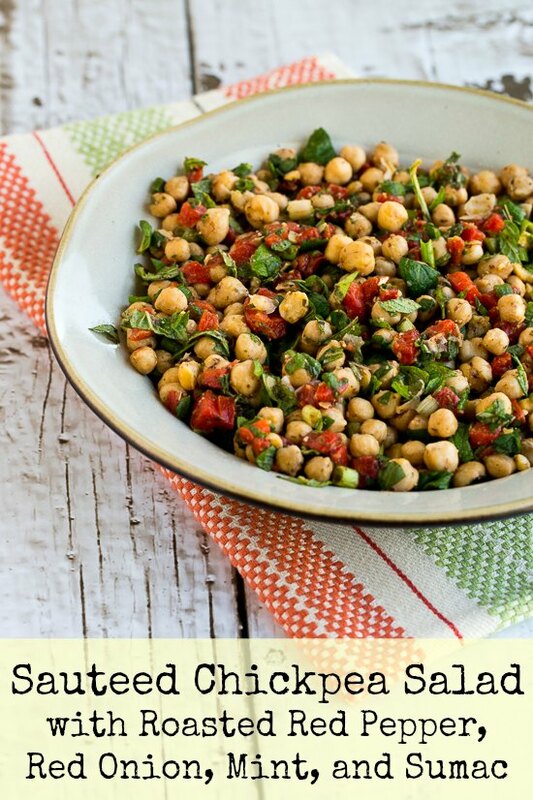 Click here to PIN Sauteed Chickpea Salad with Sumac! I had known about Sumac for years, but when a reader sent me a great recipe for Fattoush a few years ago I learned the trick of mixing Sumac into the dressing for a flavor boost that’s really delightful, and I’ve been using it that way ever since. Then I went to Istanbul and met Zerrin, and she gave me some wonderfully fresh Sumac from Turkey. And when I read that Sumac is one of the ten most popular spices used in Turkish Cuisine, and I knew I had to update the photos for this recipe so I could encourage you to use more Sumac in your kitchen! Saute the rinsed and drained chickpeas in olive oil, with a teaspoon of Sumac stirred in. 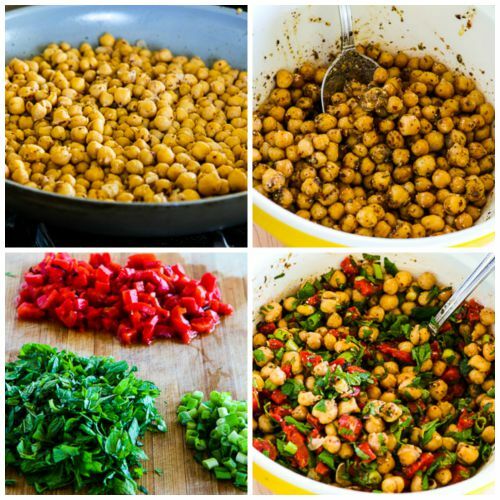 Whisk together the dressing and when the chickpeas are nicely browned, put them in a bowl, pour dressing over, and let them marinate in the dressing while you prep other ingredients. Chop up the drained red peppers and mint and slice the green onion (or chop red onion). When chickpeas are cooled to room temperature, mix in the red pepper, mint, and green onion and season salad with salt and fresh ground black pepper and serve. This salad can be refrigerated before you serve it, and it will keep for a day or two in the fridge, although I like it best when it’s freshly made. Make it a Meal: This would be great with Very Greek Grilled Chicken or Greek Seasoned Grilled Pork Chops for a low-glycemic meal, or serve it with something like Spicy Grilled Eggplant for a vegetarian meal. If you haven’t tried Sumac, get some soon and make this salad! Put chickpeas into a colander placed in the sink and rinse with cold water until no more foam appears. Let chickpeas drain well, or pat dry with a paper towel if you want to speed it up a bit. Heat 1 T olive oil in a large frying pan, add drained chickpeas, sprinkle with 1 tsp. ground Sumac, and saute chickpeas until they are lightly browned. This will take about 10 minutes, turning the chickpeas several times so they get browned on all sides. While chickpeas are cooking, put roasted red peppers into a colander and let them drain well. Whisk together the lemon juice, ground Sumac, dried mint (If using), salt, finely minced garlic, and olive oil to make the dressing. When chickpeas are nicely browned, put then in a bowl and combine with about half the dressing. Let the chickpeas marinate while you prep the other ingredients. Wash mint, spin dry or dry with paper towels, and chop. When red peppers are well drained, chop them into small bite-sized pieces. When chickpeas have cooled to almost room temperature, combine them with the diced roasted red pepper, chopped mint, and capers in a medium-sized salad bowl. Stir in enough dressing to lightly moisten all ingredients. The salad can be served immediately, or it can marinate all day or even overnight in the fridge. This recipe adapted from Spanish Chickpea Salad at The Taste Space. 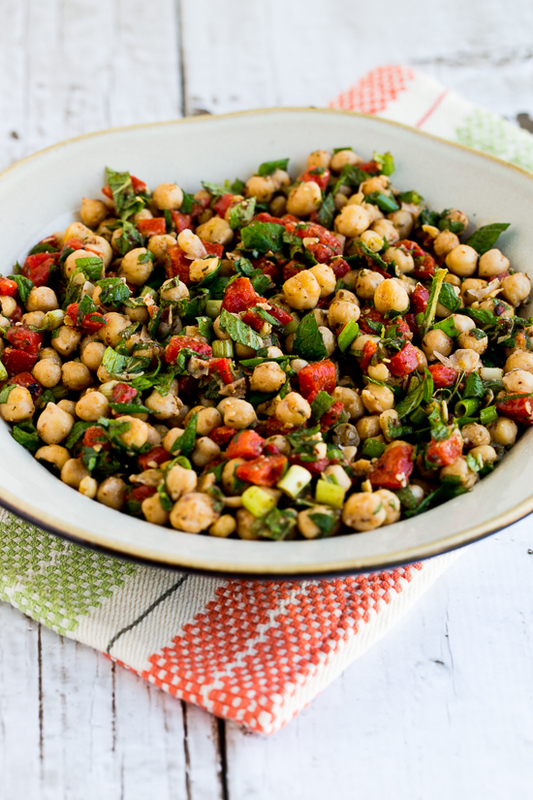 Sauteed Chickpea Salad with Roasted Red Peppers, Mint, and Sumac is too high in carbs to be suitable for strict low-carb diets. However, everything in this salad is a low-glycemic ingredient that would be approved for the South Beach Diet. Dried beans are limited to 1/3 – 1/2 cup serving for Phase One and I would definitely serve this as a side dish salad if you’re actively trying to lose weight. Love the updated photos (and love sumac, too)! This sounds so delicious! And I do indeed have a lot of sumac in my spice collection, just waiting to be made into plenty of salad. 🙂 Yay! Eileen yay! Hope you enjoy. Thanks for the inspiration Janet! Thanks Joanne! Sumac is so nice and tart, love it! Sumac is definitely one of my favorite spices! I love it in salads like this! Cara, I do think sauteeing the chickpeas really bumped up the flavor! I certainly noticed the sumac, but was most intrigued by the sauteed part – what a great way to prepare a chickpea salad! Peggy, I am craaaaazy about Sumac. If you like lemon you'll love it. Hillary, I loved it. I'm not a vegetarian, but I am trying to eat a lot more meatless meals these days. I know what I'm packing for lunch in a few days! Although I'm not vegan just vegetarian, I love making completely veggie meals. It's affordable and yummy. Nice work. Karen, yes I mean the brine from the bottle of capers. Good catch though, I will edit to make it more clear. Thanks! What do you mean with caper juice? I will use bottled capers. Do you mean the liquid from the bottle or actual caper juice? Barbara, I do agree that the ones you cook yourself are a tiny bit better, but as you said, it's so hard to plan that far ahead. Fun hearing that Sumac really is used all over the world! Lovely combination Kalyn. In the past I always used dried chick peas and went through the process of soaking and cooking. Resulting in we ate less chickpeas as it needed planning ahead. (something I'm not good at;) Following your lead and using canned chickpeas we eat them more often. I has sumac in my pantry when we lived in NZ but haven't bought any here yet. You have reminded me to look for it now. Maria, me too. I can't figure out why some people don't really like them! Thanks Judith. I am crazy over Sumac!! Sumac has such a great flavor–so tart and refreshing. Great recipe, Kalyn! I love chickpeas and this salad is loaded with flavor. Great recipe Kalyn! Joanne, I'm positive you'll become a Sumac fan when you try it! Dave, I think that's a great idea. Janet, I have no doubt. And I love your blog! This is a great dish and will definitely have to try it with sumac. If you don't have sumac, though, this is still a great dish. oh my… Stunning photos, great recipe and I am just pondering doubling up, serving the side dish and then simply whipping things in a blender till you have a dip! I bought some sumac earlier this year and haven't done very much with it! I still need to make your sweet potato hummus with it, but when I do, this dish is coming along for the ride! These look so delicious- I am a huge fan of chic peas and always looking for new ways to cook them! I don't know why some comments take so long to come to my e-mail, but truly I am not ignoring people! Eggplant43, glad I can inspire you to try them. Jeanette, I do think this would be good slightly warm. You will love Sumac, I promise! Next time I'm at Penzey's I'll have to pick up some sumac. I do have zaatar, but am curious about sumac. This salad sounds like it would be really good served warm or room temperature. I recently purchased both Sumac, and Za'atar, but had not used either one yet. Problem solved, as I love anything chickpea, so thanks for the motivation. T.W., I am just crazy about Sumac. If you're had Za'atar, it's the main ingredient in that. I bet you'd love it. I've never cooked with sumac. I will have to check it out. I understand it's got such an ancient history. I'm a fan of anything with chick peas. Julie, you are pretty sharp! Yes, I served this on the side with Grilled Mahi Mahi with Lemon and Capers. Thanks for the reminder to go there and add a link, because someone else asked about it. And thanks for the reminder about Penzeys too. Did you know that the owner of The Spice House and Penzeys are brother and sister? I haven't met Bill Penzeys, but I met Patricia Penzey Ord at the store and she talked to me again at IAC in Austin. Kalyn, is this the recipe for the side you showed with the grilled mahi mahi a few days ago? It looks similar, and I've been looking forward to finding out what that was because it looked so good! I've also found sumac at Penzeys, in case people are looking for additional sources.